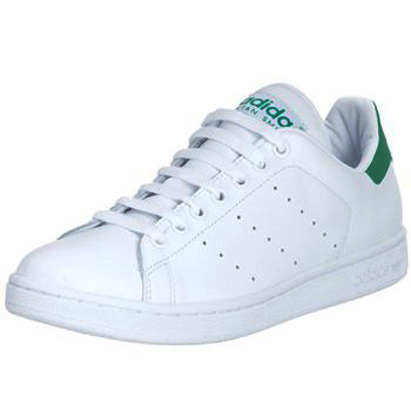 In the mid 1980s, my crush and best friend, Danny always wore white Adidas Stan Smiths sneakers. These tennis shoes were called Stan Smiths after the famous 1960s / 1970s American tennis star. They were simple white leather Adidas sneakers, only they were designed without the telltale Adidas stripes. Instead, there were three row rows of small air vent type holes where the brand's lines usually appear. An image or sketch of the famous Stan Smith tennis player appeared on the tongue in green. The detailing colors on the pair Danny owned, was a Kelly green. Though the sneakers also came in white with navy blue (maybe this was later on), the green and white were the most popular Stan Smiths Adidas sneakers. I myself had a pair and thought I was the coolest, hippest kid on my Long Island block. Did you once sport a pair of sneakers that made you feel especially fashionable, hip or cool? You either wore Stan's or K-Swiss. I will admit that I once owned a $75 pair of high-top black, white, and LIME GREEN sneakers, and I thought that they were The. Coolest. Thing. Ever! I don't even remember what brand they were, but it was a well-known brand. I still wear Stans, even though they call them something else now. Last time anyone saw Stan was in the early 1970s. He was a famous tennis player in the 1960's. Green/white is the go-to color although they have a variety now. Zips were a low-maintenance Converse Chuck Taylor look-alike. In the words of the Fresh Prince (whatever happened to that guy? ), "I asked my Mom for Adidas and she bought me Zips..."